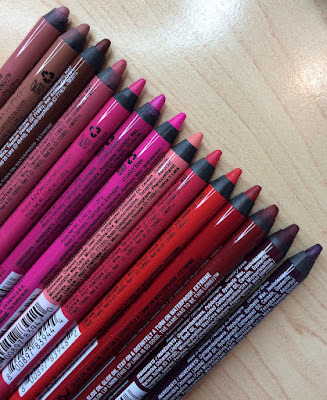 You can check out my video for more of an overall review of these, but in a nutshell, they're creamy matte lip colors that you apply with a wand applicator. 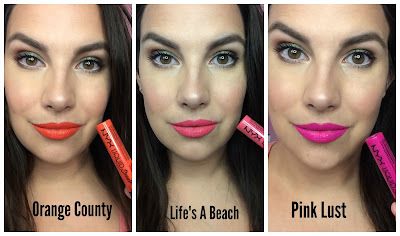 These shades are quite pigmented-- in the pictures, you're seeing how they look with just one layer all over my lips. If you notice any shine on any of these- it's probably because I was quickly applying these to the lips and didn't allow it to fully dry. The flat nature of the wand applicator allows for a really precise application, which I love. Something important to note about the formula... it doesn't COMPLETELY dry on the lips, unlike certain other liquid lipsticks. You'll notice a bit of a tacky feel... it's not uncomfortable like a sticky gloss might feel, but you can definitely sense it when you press your lips together. 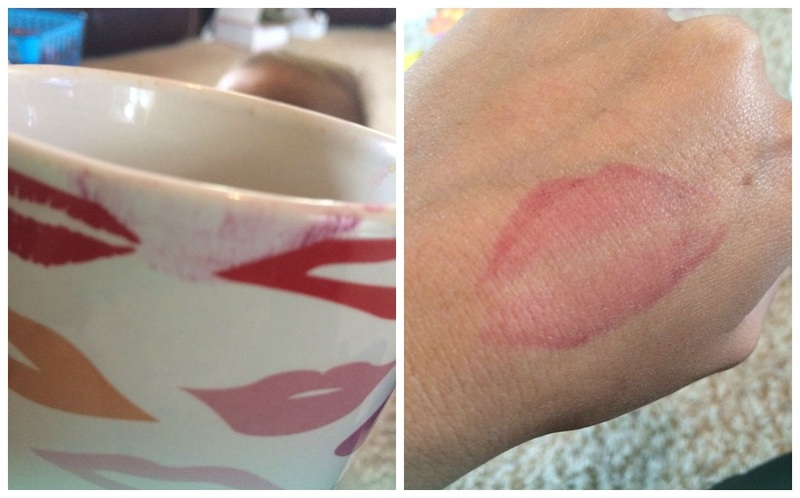 These lip colors will transfer off onto a cup or skin... but only partially. I still notice a great deal of remaining color on my lips, but I just wanted you to see that they're not transfer-resistant. And if you happen to be eating anything that might be the slightest bit moist- things can get a little messy. It almost re-liquifies the product slightly. 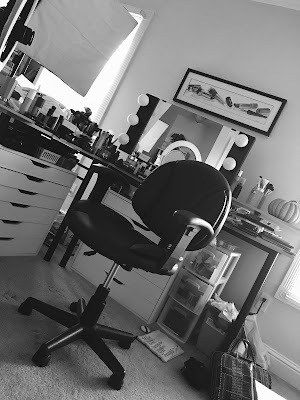 All in all, I enjoy the lightweight, velvety texture of these products. The application is easy, and I love the finished look. The reds in this collection are some of my favorites, especially Kitten Heels. It's just the perfect pure red! But just keep in mind that these lip colors- particularly the bold ones- may require some maintenance if you're doing a lot of talking, eating or drinking. 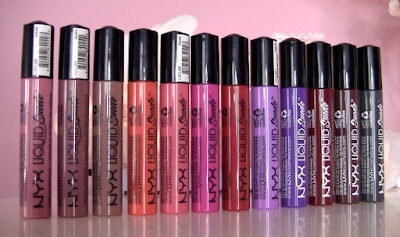 The other line of colorful goodies that I mentioned in the video are the NYX Whipped Lip & Cheek Souffle. These are so new, they're not even available at the time I'm writing this post. These feel INCREDIBLY light and creamy. 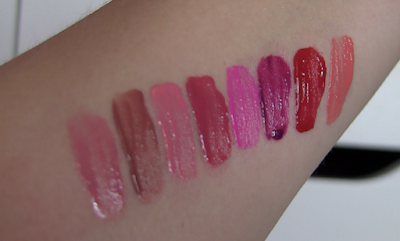 While the swatches below look shiny- they actually do dry a little on the lips and cheeks (my photo was taken right after they were applied). They end up having a somewhat velvety feel - they're just so unique. They're easy to blend onto the cheeks with fingers or a brush. I haven't had any staying power problems on the cheeks, and the staying power on the lips is better with the brighter/deeper colors. I do plan to do a full review with more explanations, because frankly, I haven't gotten to experiment with these a whole lot so far. 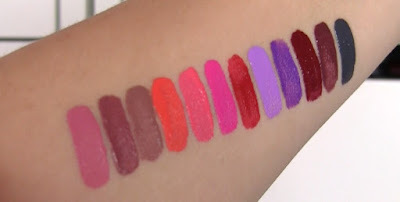 Swatches are in the same order as the products shown above. Again, this was after they were freshly swatted and this creamy formula does dry slightly. There might be the slightest hint of shine, but would probably be best described as a semi-matte finish. 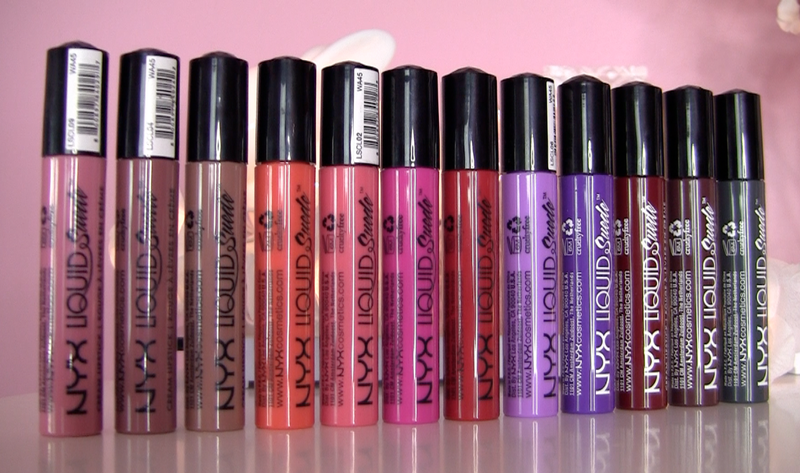 I'll make sure to show these on my lips in a future review- coming soon! You probably wouldn't wear it out of the house; but, Stone Fox looks really pretty on you!! :) I want to get Stone Fox, myself, but they are sold out on the website. I think I will have to get Cherry Skies and Vintage as well! Oh my goodness... orange county definitely isn't joking around! That's some very serious orange! 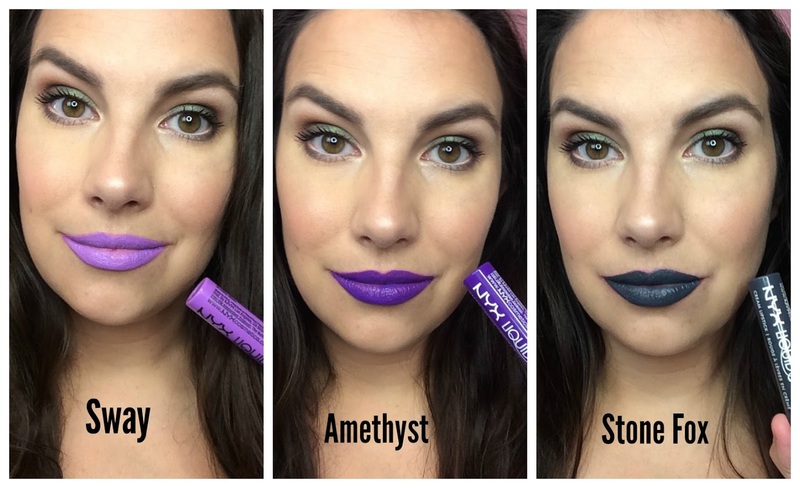 I have been so intrigued by liquid lipsticks lately but I haven't purchased any. I feel it's about time! These look SO gorgeous. Sway especially! 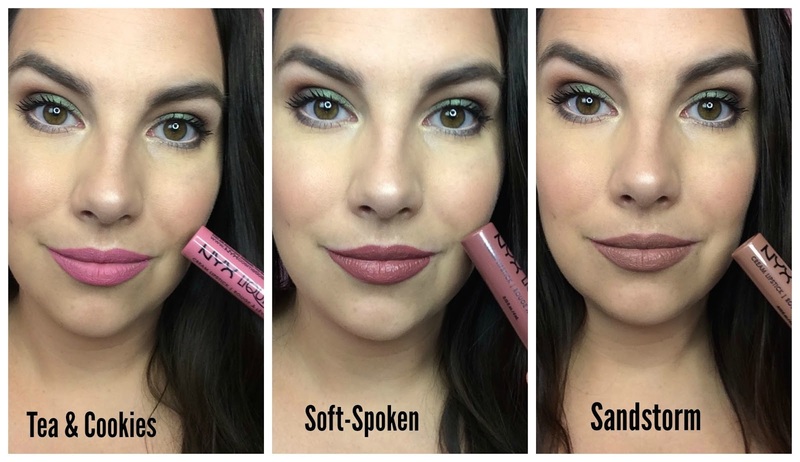 Can't wait to try NYX liquid lipsticks, Soft Spoken is such a gorgeous shade! Em, you are absolutely ROCKING Soft Spoken and Vintage! I'm intrigued by the multipurpose claims that NYX has for the Whipped lip and cheek products. Not too sure about those, but they have some beautiful colors nonetheless! Great review Emily! I want the first 3 which look amazing on you!! Thanks for the swatches. Now I have to go check out your video. Can't wait to hear more on the whipped lip and cheek soufflé!! Always love your posts. Hi Emily, when you review the whipped lip and cheek soufflé can you also be sure to include cheek swatches too? Thanks- looking forward to it! wow i like how out of the box NYX went with these colors! that's so awesome for drugstore brands to venture out like this. stone fox is amazing! Really a wonderful collection of lipsticks range you have shared here with us . They all look very good on you. Thanks for sharing such a wide range of lipsticks shades with us.I want to share something with all kidney cleanse diet or homemade detox cleanse aim is to get back to your fitness and always feel fresh to start any work in your corner.During Cleanse process you should feel better and get some fresh energy to do any work but not enough to get into gym & do some workout it behaves according to your routine. Stone fox looks wonderful! 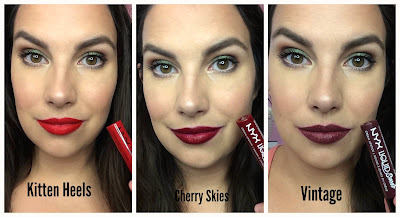 I always love your reviews and swatches! A blogger to look up to! You and your work are both wonderful!! Wow! I am in essence astonished by the way you certain out almost every single little detail. It really is truly heading to aid me a fantastic offer. Thanks for sharing your thoughts so definitely. All colors look good on you! Wanna try them too. Thank you for sharing this very useful content. Surely I will share to my friends and colleagues in the office the right things that you talked about. Once again thank you for the sympathy, the words you gave to the sentence. - Material for making umbrellas are high quality umbrellas, 100% sure of not wetting. Customers can bring their umbrellas at ease without the fear of wetting furniture or other belongings. - Production time for each single large size from 10 to 15 days, so you should connect soon with umbrella Viet Nhat Company we do not lose the opportunity to send gifts to your customers. - All the items sold at our factory are all genuine warranty for you, ensuring the kind of purchase at our facility will make you feel happy and comfortable. It is not, at that point, a straightforward matter of making a twofold installment one month from now in addition to somewhat additional for charges, since the advances are not figured on typical loan fees. What really happens is more extreme than only a basic charge. I am very thanks for the blog post. I may see a good deal of approaches after seeing your post, photoshop online Alternative is a perfect alternative to photoshop and play cool math games for kids and everyone. Enjoy brain training with math and logic games. Yay glad to have you around full time! Thank you for sharing the review! Celebrities prefer to purchase twitter followers as a strategy to increase status in a small span.